At first glance, “Karma” appears to be completely competent, aggressively inessential television. The episode is very focused, which is admirable, but too much of a good thing can be a problem. “Karma” spends a lot of time harping on the well-recognized fact that revenge is a dangerous, self-destructive impulse. The temptation to deal with pain by exacting vengeance, thereby making bad situations worse, is one of the most well-explored aspects of human nature in storytelling because of its dramatic potential; lest we forget, Revenge is a show that somehow still airs on ABC, and it alone has covered all of this territory fairly extensively. Basically, revenge is one of those well-trod topics that shouldn’t be the major focus of an episode unless the story can add something new to the conversation, and this episode both does and doesn’t. This mediation on vengeance begins when number of the week Dr. Edwards is introduced as a psychologist delivering justice on behalf of those of his patients who have been wronged. Instead of preventing illegal activity from taking place like Reese and Finch are able to thanks to the Machine, Edwards doles out vigilante justice by framing wrongdoers for crimes they didn’t actually commit. Disappointingly, this mission has nothing to do with Edwards’ specific psychology as a psychologist, which is a specific, complex mentality ripe with storytelling potential, and all to do with his past, which includes the obligatory Murdered Spouse™. The final name that Edwards wants to cross off of his revenge list is his wife’s killer, as tradition dictates, but Finch intervenes before Edwards can commit suicide in order to frame Morris and end his own misery. There isn’t much complexity to this story, at least not in the way it’s presented. One of the only attempts to flesh out Edwards’ character involves a dog and an embarrassingly boring attempt at flirtation from a neighbor. The only attempt at surprise occurs when it’s revealed that Edwards plan is to commit suicide and frame Morris instead of simply shooting him point blank; neither option is interesting enough for this twist to have much impact. The question as to whether or not Morris was actually guilty of killing Edwards’ wife is left open-ended, which could be seen as a somewhat unique choice, but does it really matter if Morris is guilty of assault and a murder attempt that’s only thwarted because of Reese’s intervention? Either way, Edwards’ acts of vengeance beget others’ acts of vengeance, and the cycle continues on until this obsession consumes everyone involved. There are some efforts to connect this story of vengeance to the main characters’ journeys, and some are more successful than others. A reference to Shaw and other characters’ unproductive experiences with revenge is relevant but half-hearted. A flashback depicts Finch’s decision to reject the temptation to exact revenge on a Northern Lights agent’s life despite her possible complicity in his best friend’s death. Based on Finch’s character, his decision to spare this woman’s life isn’t particularly surprising, and the scenes don’t provide enough depth or context to make much of an impression. The best application of the revenge theme involves Reese, and although subtlety is one of the greatest hallmarks of quality storytelling, the meaning behind Reese’s outpouring to his therapist is so subtle that its implications may not have dawned on some viewers, especially if they don’t remember every aspect of this long-running show’s complex mythology, which is understandable. Reese has been making incremental progress in his therapy sessions, and his psychologist’s prompting leads to his opening up about the death of his ex-girlfriend, Jessica. Before he met Finch, Reese was both alcoholic and suicidal because of Jessica’s death, a tragedy that he later learned was caused by Jessica’s husband, Peter. At the time, Finch had not yet fully perfected his mission with the Machine, so he received her number but couldn’t prevent her death. 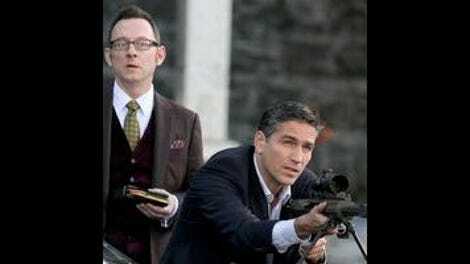 Reese eventually tracked down Peter and had his revenge; the end of “Many Happy Returns” implies that Reese either murdered Peter or framed him for drug running. Whatever brief satisfaction he may have felt then hasn’t fixed Reese; he’s still a broken man, but a man driven to prevent wrongdoing, partly because of his inability to do so in the past. Both Reese and Finch have experienced loss, but instead of being paralyzed by those painful memories and trapped by personal vendettas, both men have used this fuel to accomplish great things on behalf of others. If only they spent more time leaning on one another. · I assume that the technological issues I had posting this review were due to karma. Sorry TV gods, they can’t all be A episodes. · Edwards’ dog is no Bear. Bear would’ve run away from that guy; his lack of game would’ve been too depressing to witness.